Featured: Aqua Blu Polished Porcelain and Glass Silver Diamond. Large-format tile. When you hear the term, you might think to yourself, “It’s just a big piece of tile. So what?” There’s a reason why tile retailer, The Tile Shop, is excited about these big pieces, and you should be, too. These tiles bring numerous style and maintenance benefits to your design, which is why The Tile Shop believes 2019 is the year of large-format tile. The popularity of large-format tiles (LFTs) isn’t the only thing that has grown over the years. Ten years ago, tiles with a 12-inch side were considered large format. By 2019’s standards, one side of the tile must exceed 16 inches. That’s a bigger difference than it might sound! The increased size can greatly change the appearance of a room. Using large-format tiles horizontally will make a room appear wider, and using LFTs vertically will create the appearance of a taller space. 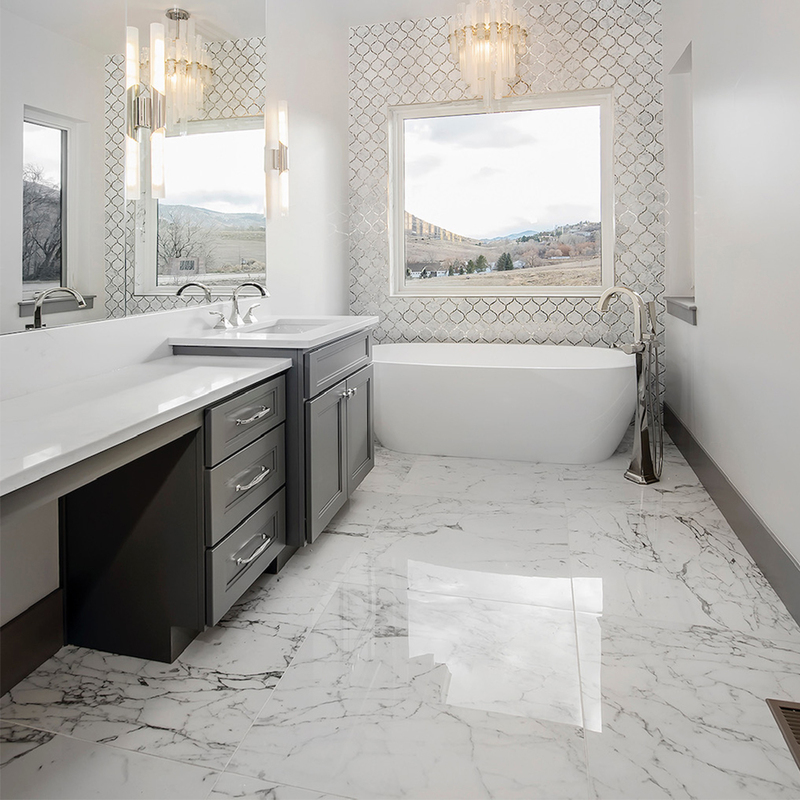 Take a look at Russo Residential’s gorgeous bathroom below. By incorporating The Tile Shop’s 30-inch by 30-inch Venato Blanco polished porcelain LFT, they were able to create the illusion of the bathroom looking wider than it actually is. Featured: Venato Blanco Polished Porcelain. Design by Russo Residential. Photo by Nita Torrey Photography. Large-format tiles can either be square or rectangular shaped and are available in porcelain or ceramic. Because LFTs appreciate the size of spaces, they are a spectacular option for kitchens, entryways, mudrooms, or any large, open areas. In addition to being a unique and durable flooring option, The Tile Shop’s favorite advantage of LFT designs is the minimal amount of grout lines. Not only does this create smoother surfaces, but it also makes the space easier to clean and requires less maintenance. Unite your entire space by creating a cohesive design. The Tile Shop’s selection contains LFTs prepared to support a statement or be the center of attention. As seen in the first image, you can create a truly dynamic and eye-catching space by pairing large-format tiles with mosaics to see the opposite sizes play off each other. 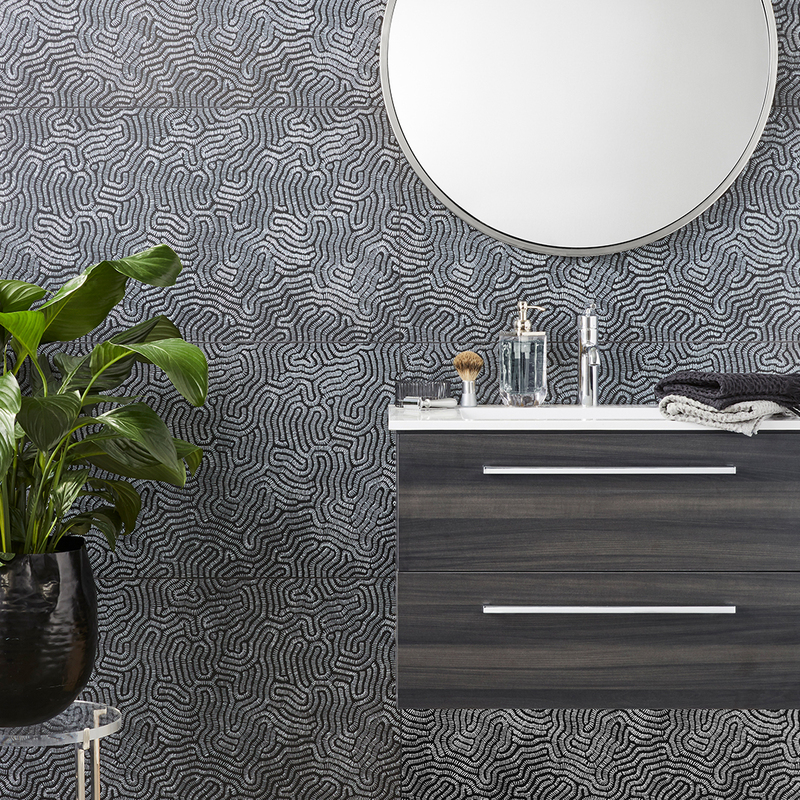 The 18-inch by 35-inch Metalica Cell Silver ceramic tile in the image below follows the wallpaper-effect trend. 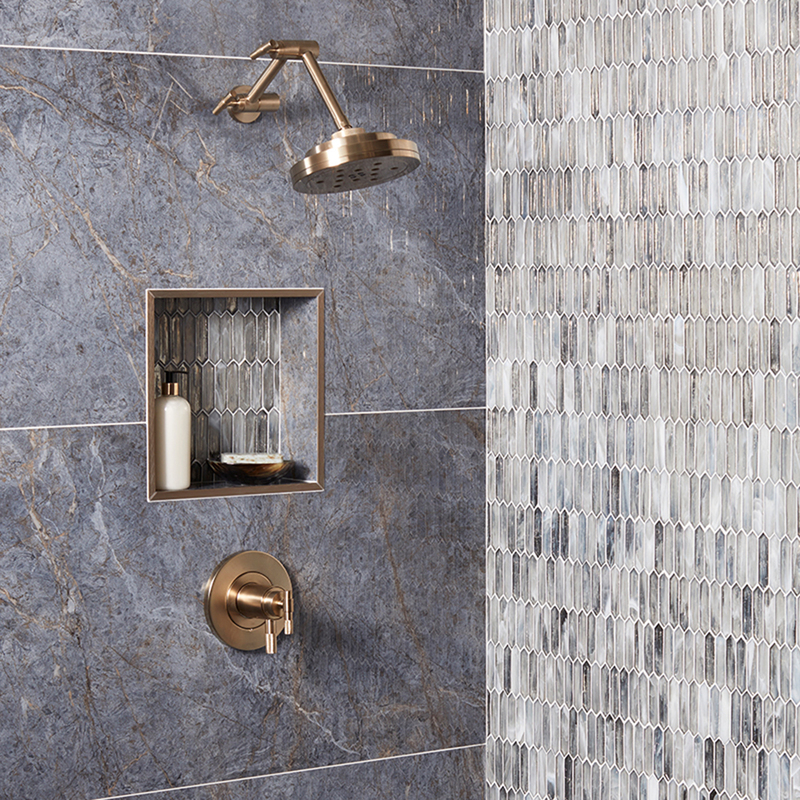 This tile creates a dramatic effect through a uniquely textured pattern while the neat, minuscule grout joints almost completely disappear from this modern space. Featured: Metalica Cell Silver Ceramic. Are you ready to maximize you space? Stop in your closest Tile Shop to learn more about how much impact large-format tiles can have on your design.